Hi Y’all! We’ve truly been at this for a while, finalizing a really cool portable body gym. We have developed a truly tetherless piece of fitness equipment that combines resistance bands and your own body to have the ultimate fitness experience for your on the go lifestyle. What we mean by on the go is that you can travel any where, any time and workout your entire body, and that includes your abs and core! Take it to the beach, on a hike, to the office, or on a business trip. You can even take this to your gym as they won’t have a piece of equipment like this! Use it to stretch and warm up and of course a full body workout. This lightweight piece of equipment is under five pounds, fits in a travel bag, backpack, gym bag, or beach tote and can hang in any closet, pack in your suitcase and still offer you a multitude of resistance band exercises and provide you a full body workout. 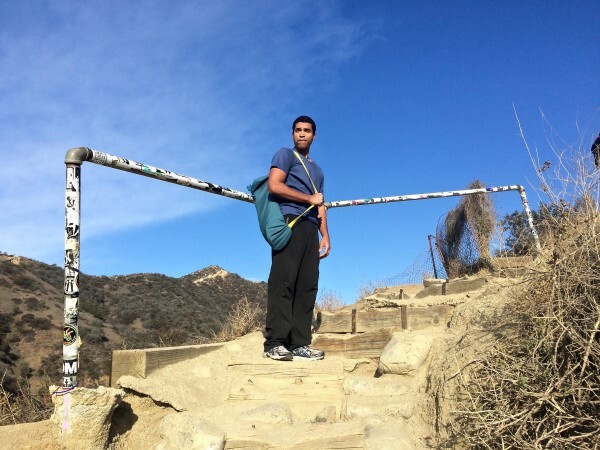 Our friend Jaimes, shown here, has taken the TritonFit on a hike in the canyons. Copyright 2015. TritonFit. All rights reserved. | Site customization by notobella designs, llc.